Richard Strauss’s last stage work is something of a curiosity. It has no action, no development, almost no plot, and none of the intricate characterization of the earlier operas. Capriccio is described as a ‘conversation piece for music in one act’. It was something of a self-indulgence for the ageing Strauss—a long consideration of the relative merit of words and music, a subject to which composers since Monteverdi had given much time and thought. Capriccio was written during 1940/41, to a libretto by Strauss’s friend the conductor Clemens Krauss, and first performed in Munich in October 1942, though the Sextet had been given privately some months before. Strauss devises a play-within-a-play and sets the opera in a pre-Revolution French château. At the start, the Sextet is heard off-stage: it opens a concert devised by the composer Flamand for the birthday of the Countess Madeleine. Flamand and the poet Olivier respectively personify music and poetry; both seek the approval and love of the Countess and both watch for her reaction to this pure music. As an independent piece, the Sextet is a welcome supplement to the meagre string sextet repertoire; by using two violins, two violas and two cellos Strauss acknowledges the Sextets of Brahms, whose chamber music he had loved since his student days. The thematic material of this prelude is later recalled in an orchestral interlude before the final scene, and again as the countess confronts her own reflection in a mirror and concludes that there is no answer to her questions and musings, and that words and music have equal merit. A glance through the catalogue of the works of Anton Bruckner reminds us of his musical upbringing and environment: choral conductor, organist, then—having heard the music of Wagner—symphonist. His early works include music for military band and for orchestra, though their harmonic conception is firmly rooted in the organ loft. Of his very few pieces of chamber music, an early string quartet was written as a student exercise for a cellist with the Linz Municipal Theatre from whom Bruckner had taken lessons in composition. It remained undiscovered until long after the composer’s death. Some time after its composition, the violinist Joseph Hellmesberger asked Bruckner to write a work for his string quartet. It was not until seventeen years later that Bruckner planned a string quintet using Mozart’s scheme of quartet with an extra viola. The Quintet was begun in December 1878, shortly after revisions to the Fourth and Fifth Symphonies. Bruckner was fifty-four. It was finished in July 1879 and shown to Hellmesberger. He was ‘not impressed’ with the Scherzo and refused to play the work, saying it was too difficult. 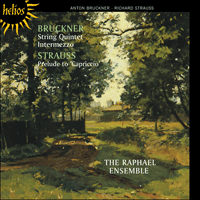 Bruckner, ever compliant and anxious to please, wrote an Intermezzo which was completed several months later. The first performances were given without the Finale—in Cologne in December 1879 by the Heckmann Quartet, and by the Winkler Quartet in Vienna the following November. The Winkler Quartet was led by Josef Schalk and the second viola was played by his brother Franz, who (though a friend and admirer of Bruckner) was later to wreak such havoc on the Fifth Symphony by making inartistic cuts and adding music of his own. In May 1883 the Winkler Quartet gave the first complete performance with the original Scherzo and the Finale. Hellmesberger’s quartet finally played it (Scherzo and all) in May 1885. What of the Quintet’s subsequent history? It was published in 1884 by Albert Gutmann and dedicated to Duke Max Emanuel of Bavaria. The Duke sent a diamond tie-pin in return; Bruckner received nothing from his publisher. The Quintet had over twenty public performances in Bruckner’s lifetime, and though it remains something of a curiosity in his total output it has a respectable reputation in the chamber repertoire and is unfamiliar to audiences merely because of its scoring and relatively unspectacular part-writing. The first movement is arguably the most appropriate to the chamber music medium. It has the ‘feel’ of a chamber work, with intricate, leaping counterpoint and chromatic figures that would be lost in an orchestral texture. There are three distinct thematic strands—a broad melody heard at the outset, a dotted figure which is passed between various instruments, and a soft curving melody. Short rhythmic motifs abound in the exposition, which ends quietly after a climax in F sharp; the development uses several of these short figures and the movement ends firmly in F major. The Scherzo has been described as both grotesque and endearing. Its jaunty D minor theme has the pulse of a country dance, though the modulations and wide leaps are redolent of a more intimate, sophisticated medium than that of the village band. The lyrical Trio is in E flat; it has a slower pulse, with a distinctive pizzicato accompaniment that recalls more symphonic writing. It is difficult to see why Hellmesberger found this movement unacceptable—his players must have known the quartets of Beethoven, some of which have part-writing which is as technically and musically demanding as Bruckner’s Scherzo. A more likely reason for his antipathy to the work was his unwillingness to show public approval of Bruckner’s work which, privately, he admired. The sublime Adagio is in G flat and forms the emotional centre of the whole work. Its effect is as profound as any of Beethoven’s late quartets or Bruckner’s own symphonic slow movements, and it is conceived on a similar scale. Indeed, the movement might easily be mistaken for a transcription of a symphonic slow movement, so confident is the handling of thematic material. There are three distinct episodes, and the movement ends in a mood of great peace and serenity. In the Finale the string players battle with over-adventurous counterpoint and an orchestral texture. Bruckner appears to be writing a towering symphonic movement for solo strings, and the effect can easily sound strained and unconvincing. The movement begins in F minor with a second subject in E major, and a fugato development incorporates short motifs from the main thematic material. The recapitulation shows masterly use of the richness of the middle-heavy ensemble, and the Quintet ends briskly and sonorously in F major. The Intermezzo has the same trio as the Scherzo which it originally replaced, and its genial directness conveys the mood of the Austrian Ländler. It has been even more neglected than the Quintet and there is no record of a public performance before 1904. La dernière Œuvre pour la scène de Richard Strauss est une curiosité: elle ne comporte pas d’action à proprement parler ni de développement, et l’étude de caractères n’y a pas la complexité des opéras antérieurs. Capriccio est décrit comme une «conversation pour partition musicale en un acte.» C’est un menu plaisir que Strauss s’accorda en son vieil âge—une longue méditation sur les mérites relatifs des mots et de la musique, auquel maint compositeur depuis Monteverdi s’était souvent livré. Capriccio fut composé au cours de l’année 1940/41 sur les paroles d’un libretto écrit par l’ami de Strauss, le chef d’orchestre Clemens Krauss, et il fut joué pour la première fois à Munich en octobre 1942, bien que le Sextuor ait été donné en privé quelques mois auparavant. Strauss imagine une pièce au sein de la pièce, et campe la scène de cet opéra dans un château français à la veille de la Révolution. Au départ, on entend le Sextuor en coulisse: il inaugure un concert que le compositeur Flamand eu l’idée de donner en l’honneur de l’anniversaire de la Comtesse Madeleine. Flamand et le poète Olivier personnifient respectivement la musique et la poésie; tous deux recherchent l’approbation et l’amour de la comtesse et tous deux épient ses réactions à cette musique pure. En tant que morceau à part, ce Sextuor vient compléter avec bonheur le maigre répertoire des sextuors à cordes. En utilisant deux violons, deux altos et deux violoncelles, Strauss rend tribut aux Sextuors de Brahms, dont il avait aimé la musique de chambre depuis qu’il était étudiant. Le matériau thématique de ce prélude est rappelé plus tard au cours d’un interlude orchestral avant la scène finale, et à nouveau au moment où la comtesse parle à sa propre image dans un miroir et conclut qu’il n’y a point de réponse à ses interrogations et à ses rêveries, sinon que les paroles et la musique ont un mérite égal. Un coup d’œil au répertoire des œuvres de Bruckner nous rappelle quels furent l’éducation musicale et le milieu de ce dernier: chef de chœur, organiste, puis—après qu’il eut entendu Wagner—symphoniste. Ses travaux de jeunesse incluent de la musique pour fanfare militaire et pour orchestre, œuvres conçues cependant par Bruckner l’organiste. Parmi les rares morceaux de musique de chambre, un quatuor à cordes fut composé par Bruckner en tant qu’exercice d’étudiant, pour un violoncelliste travaillant au Théâtre municipal de Linz et auprès duquel il avait pris des leçons de composition. Le morceau ne fut découvert que longtemps après la mort du compositeur. Quelque temps après la composition de ce quatuor, le violoniste Joseph Hellmesberger demanda à Bruckner d’écrire une œuvre pour son quatuor à cordes. Ce ne fut que dix-sept ans plus tard que Bruckner conçut un quintette à cordes qui utilisait le schéma mozartien d’un quatuor avec un alto de plus. Le Quintette fut commencé en décembre 1878, peu après les révisions des Quatrième et Cinquième Symphonies: Bruckner avait alors cinquante-quatre ans. Il fut achevé en juillet 1879 et montré à Hellmesberger. Ce dernier ne pensa pas grand’chose du Scherzo, et refusa de le jouer, protestant qu’il était trop difficile. Bruckner, toujours accomodant et anxieux de plaire, écrivit un Intermezzo qu’il compléta plusieurs mois plus tard. Le Quintette fut d’abord donné en concert sans le Finale, à Cologne en décembre 1879, par le Quatuor Heckmann, et par le Quatuor Winkler à Vienne, au mois de novembre suivant. Le Quatuor Winkler était dirigé par Josef Schalk et le second alto était joué par son frère Franz qui (bien qu’ami et admirateur de Bruckner), devait plus tard causer tant de dommages à la Cinquième Symphonie en y faisant des coupures sans goût et en y ajoutant de la musique de son cru. En mai 1883, le Quatuor Winkler en donna le premier concert complet, avec le Scherzo original et le Finale. Le quatuor de Hellmesberger finit par le jouer (avec le Scherzo et tout le reste) en mai 1885. Que devint le Quintette par la suite? Il fut publié en 1884 par Albert Gutmann et dédié au duc Max Emanuel de Bavière. Le duc envoya à Bruckner, en retour, une épingle à cravate en diamant; Bruckner ne reçut jamais rien de son éditeur. Le Quintette fut joué en public plus de vingt fois de la vie du compositeur, et bien qu’il soit encore une curiosité au sein de son œuvre, il jouit d’une réputation solide dans le répertoire de la musique de chambre et n’est si peu connu du public qu’à cause de son arrangement musical et de l’écriture assez peu impressionante de ses parties. Le premier mouvement a pu être considéré comme celui qui se prête le plus au moyen d’expression offert par la musique de chambre. Il en a le contrepoint complexe et bondissant et les figures chromatiques, qui seraient perdus dans une structure orchestrale. Il comporte trois fils thématiques distincts: une large mélodie que l’on entend d’emblée, une figure à notes pointées qui passe d’un instrument à l’autre, et une mélodie qui déploie doucement ses courbes. De courts motifs rythmiques abondent dans l’exposition, qui se termine calmement après son apogée en fa dièse; le développement a recours à plusieurs de ces courtes figures, et le mouvement se termine fermement en fa majeur. Le Scherzo a été qualifié à la fois de grotesque et d’aimable: son thème enjoué en ré mineur possède le battement rythmique d’une danse de campagne, bien que par ses modulations et par ses grands bonds il rappelle plutôt une musique plus intime et sophistiquée que celle de l’orchestre de village. Le Trio lyrique est en mi bémol; le rythme en est plus lent, avec un accompagnement en pizzicato qui lui est propre, et qui évoque une écriture plus symphonique. Il est difficile de comprendre pourquoi Hellmesberger trouva à redire à ce mouvement: ses exécutants connaissaient sans doute les quatuors de Beethoven, dont certains comportent des parties aussi techniquement et musicalement exigeantes que le Scherzo de Bruckner. L’antipathie de Hellmesberger pour cette œuvre était due plus probalement à sa réticence à manifester publiquement son approbation pour une œuvre qu’il admirait en privé. Le sublime Adagio est en sol bémol, et forme le centre émotionnel de toute l’œuvre. Il ne le cède en rien, en profondeur, aux quatuors tardifs de Beethoven, ni aux mouvents symphoniques lents de Bruckner lui-même, et il est conçu à une échelle semblable. Ce mouvement pourrait même être pris pour une transcription d’un mouvement symphonique lent, tant le maniement du matériau thématique montre de confiance. Il comporte trois épisodes distincts, et le mouvement se termine sur une note de paix profonde et de sérénité. Dans le Finale, les cordes sont aux prises avec un contrepoint excessivement hardi et une structure orchestrale. Bruckner semble ici écrire un mouvement symphonique pour cordes seules de la plus grande envergure, et l’effet peut en sembler forcé et peu convaincant. Le mouvement commence en fa mineur avec un second sujet en mi majeur, puis un développement fugué incorpore de brefs motifs pris au matériau thématique principal. La récapitulation fait ressortir la richesse de l’ensemble moyennement lourd avec maîtrise, et le Quintette se termine, vif et sonore, en fa majeur. L’Intermezzo recourt au même trio que le Scherzo qu’il remplaçait à l’origine, et sa franchise aimable rappelle la veine des Ländler autrichiens. Il a souffert de l’oubli même plus que le Quintette, et il n’y a pas d’indication qu’il ait été joué en public avant 1904. Richard Strauss’ letztes Bühnenwerk ist eine Kuriosität: es besitzt keine dramatische Bewegung, keine Entwicklung, fast gar keine Handlung, und läßt ganz die feine Charakterzeichnung der früheren Opern vermissen. Capriccio wird als ein „Konversationsstück für Musik in Einem Akt“ beschrieben. Für den alternden Strauss war es eine Art von Nachgiebigkeit gegen sich selbst, eine lange Betrachtung des relativen Wertes von Wort und Musik, für welche kein Komponist seit Monteverdi viel Zeit und Überlegung aufgebracht hatte. Capriccio wurde 1940/41 zu einem Libretto des Dirigenten Clemens Krauss, einem Freund von Strauss, geschrieben, und im Oktober 1942 in München uraufgeführt. Das Sextett war schon einige Monate zuvor im privaten Kreise gespielt worden. Als dramatischen Kunstgriff gebraucht Strauss ein „Spiel im Spiel“ und läßt die Oper in einem französischen Schloß in der Zeit vor der Revolution stattfinden. Zu Beginn hört man hinter der Bühne das Sextett: es eröffnet ein von dem Komponisten Flamand anläßlich des Geburtstages der Gräfin Madeleine ersonnenes Konzert. Flamand und der Dichter Olivier personifizieren Musik beziehungsweise Dichtung; beide suchen die Anerkennung und Liebe der Gräfin und beide beobachten ihre Reaktion zu dieser reinen Musik. Als eigenständiges Musikstück betrachtet ist das Sextett eine willkommene Ergänzung des kärglichen Bestands an Streichsextetten; indem er zwei Violinen, zwei Violen und zwei Celli gebraucht, zollt Strauss den Sextetten von Brahms Anerkennung. Die Kammermusik des Komponisten hatte er seit seiner Studentenzeit geliebt. Der thematische Stoff dieses Präludiums wird später in einem Zwischenspiel für Orchester vor der letzten Szene wiedererweckt, und dann noch einmal: als nämlich die Gräfin ihrem eigenen Spiegelbild gegenübersteht und den Schluß zieht, daß es keine Antwort auf ihre Fragen und Grübeleien gibt und daß Wort und Tonkunst von gleichem Werte sind. Ein Blick durch das Verzeichnis der Werke Bruckners ruft uns seinen musikalischen Werdegang und seine musikalische Umgebung in Erinnerung: Chordirigent, Organist, dann— nachdem er die Werke Wagners gehört hatte—Symphoniker. Unter seinen frühen Arbeiten befinden sich Musik für Militärkapelle und für Orchester, doch ist die harmonische Konzeption beider fest im Orgelchor verwurzelt. Von den sehr wenigen Stücken Kammermusik wurde ein frühes Streichquartett als Etüde für einen Cellisten des Linzer Stadttheaters geschrieben, von dem Bruckner Unterricht in Kompositionslehre genommen hatte. Bis lang nach dem Tode des Komponisten blieb es unentdeckt. Einige Zeit nach der Entstehung des Quartetts richtete der Geiger Joseph Hellmesberger die Bitte an Bruckner, ein Werk für sein Streichquartett zu schreiben. Erst siebzehn Jahre später plante Bruckner ein Streichquintett, in welchem er dem Mozartschen Quartettschema eine weitere Bratsche hinzufügte. Das Quintett wurde im Dezember 1878, kurz nach der Revision der Vierten und Fünften Sinfonien, begonnen: Bruckner war 54 Jahre alt. Im Juli 1879 schloß er die Arbeit daran ab und zeigte es Hellmesberger. Dieser war von dem Scherzo „nicht beeindruckt“ und weigerte sich, das Werk zu spielen, da es zu schwierig sei. Der immer nachgiebige und auf Anerkennung erpichte Bruckner schrieb daraufhin ein Intermezzo, welches er einige Monate später fertigstellte. Die ersten Auffuhrungen—im Dezember 1879 in Köln durch das Heckmann-Quartett und im folgenden November in Wien durch das Winkler-Quartett—fanden ohne das Finale statt. Das Winkler-Quartett wurde von Josef Schalk geleitet und die zweite Bratsche wurde von seinem Bruder Franz gespielt, der, obwohl er ein Freund und Bewunderer Bruckners war, später der Fünften Sinfonie durch unkünstlerische Kürzungen und Hinzufügen eigener Musik solch verheerenden Schaden zufügen sollte. Im Mai 1883 gab das Winkler-Quartett den ersten vollständigen Vortrag, der sowohl das ursprüngliche Scherzo als auch das Finale einschloß. Dann endlich, im Mai 1885, spielte Hellmesbergers Quartett es einschließlich des Scherzos und alles Übrigen. Was läßt sich zur weiteren Geschichte des Quintetts sagen? Es wurde 1884 von Albert Gutmann veröffentlicht und dem Herzog Max Emanuel von Bayern gewidmet. Der Herzog schickte eine diamantene Krawattennadel als Anerkennung, von seinem Verleger bekam Bruckner nichts. Das Quintett wurde zu Bruckners Lebzeiten zwanzigmal öffentlich aufgeführt, und obwohl es in seinem Gesamtschaffen nach wie vor als Kuriosität zu betrachten ist, besitzt es im Repertoire der Kammermusik einen beachtlichen Ruf und ist dem Publikum lediglich aufgrund seiner Instrumentation und seines wenigsensationellen mehrstimmigen Satzes fremd. Der erste Satz dürfte wohl der für das Medium der Kammermusik am besten geeignete sein. Er „fühltsich an“ wie ein Stück Kammermusik, mit seinem komplizierten, beweglichen Kontrapunkt und chromatischen Figuren, die in einer für das Orchester konzipierten Struktur vollkommen untergehen würden. Es sind hier deutlich drei thematische Stränge zu erkennen: eine zu Beginn gehörte, ausladende Melodie; eine punktierte musikalische Figur, die von verschiedenen Instrumenten aneinander übergeben wird; und eine sich sanft biegende Melodie. Kurze rhythmische Motive sind in der Exposition im Überfluß vorhanden, und diese wird nach einem Höhepunkt in Fis leise beschlossen; die Entwicklung benutzt mehrere dieser kurzen Figuren und der Satz endet in einem bestimmten F-Dur. Das Scherzo hat man als zugleich grotesk und liebenswert beschrieben: sein flottes Thema in d-Moll hat den Rhythmus eines Volkstanzes, doch deuten seine Modulationen und weiten tonalen Sprünge ein intimeres, anspruchsvolleres Medium an als das der Dorfkapelle. Das lyrische Trio ist in Es; sein Rhythmus ist langsamer, mit einer klar erkennbaren Pizzicato-Begleitung, die wie aus einem sinfonischen Werk klingt. Es ist schwer zu begreifen, daß Hellmesberger diesen Satz nicht akzeptabel fand—seine Musiker müssen Beethovens Quartette gekannt haben, von denen einige eine polyphone Schreibweise besitzen, die technisch und musikalisch genauso hohe Anforderungen stellt wie Bruckners Scherzo. Viel wahrscheinlicher ist, daß seine Antipathie gegen das Werk daher stammte, daß er nicht gewillt war, Bruckners Arbeiten, die er privat bewunderte, öffentlich anzuerkennen. Das überragende Adagio in Ges bildet das Gefuhlszentrum des ganzen Werkes. Seine Wirkung ist so tiefgehend wie die eines jeden der späten Beethovenschen Quartette, oder die von Bruckners eigenen langsamen sinfonischen Sätzen, und ist in einem ähnlichen Maßstab konzipiert. Ja, der Satz könnte sogar leicht falschlich für die Transkription eines langsamen Sinfoniesatzes gehalten werden, so selbstsicher ist die Behandlung seines thematischen Stoffes. Es zeichnen sich klar drei verschiedene Episoden ab, und der Satz klingt aus in einer Stimmung tiefen Friedens und großer Heiterkeit. Im Finale mühen die Musiker sich mit einem allzu abenteuerlichen Kontrapunkt und mit der orchesterhaften Werkstruktur ab. Es scheint hier, als ob Bruckner einen großartigen sinfonischen Satz für Solostreicher geschrieben habe, und sein Klang kann leicht überlastet und wenig überzeugend wirken. Der Satz beginnt in f-Moll, mit einem zweiten Thema in E-Dur, und eine figurierte Entwicklung macht sich kurze Motive aus dem thematischen Hauptmaterial zu eigen. Die Reprise macht meisterhaften Gebrauch vom reichen Potential eines mittelgroßen Ensembles, und das Quintett endet rasch und klangvoll in F-Dur. Das Intermezzo hat dasselbe Trio wie das Scherzo, welches es ursprünglich ersetzt hatte, und in seiner liebenswerten Direktheit gibt es die Stimmung des österreichischen Ländlers wieder. Es ist sogar in noch größerem Maße als das Quintett vernachlässigt worden und es läßt sich keinerlei Beleg für eine öffentliche Aufführung vor 1904 finden.